Christ's School is a Church of England voluntary-aided secondary school. It is an inclusive Christian community committed to developing Christian values through everything that we do. We recognise that members of our community might not share this faith but we ask for a commitment to our values. It is these shared values which have shaped Christ’s over recent years and which give Christ’s school its distinctive character. We welcome staff and students of all faiths and none. We strive to develop mutual understanding and respect between faiths and we support staff and students in nurturing their own faith. As a community which includes people of a range of faith backgrounds, we celebrate both our distinctive Christian ethos and the diversity of religious traditions within our school. We have a lovely chapel which offers hospitality to support the spiritual lives of all members of our multi-faith community. 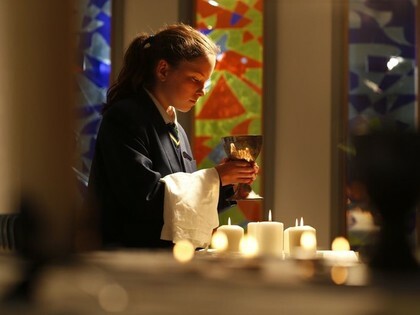 Collective Worship is a central feature of our life at Christ’s School, having regular acts of worship to mark the Christian liturgical year and significant school events. Through Collective Worship we explore themes related to our values. Each day a tutor group has a prayer and a reflection, setting the tone for the day. This usually takes place in tutor time but regular assemblies offer a longer opportunity for worship, celebration and reflection. Students and staff are encouraged not only to learn about our values but also to live them, focussing on our desire to be a community together of all ages. Throughout their years at Christ’s School, students have ample opportunities to reflect upon their development, both academic and personal. Behaviour and relationships in school are guided by our values, and lapses in behaviour are measured against them. The principles of ‘Ready Respectful, Safe’ underpin the values of ‘Love, Justice and Peace’ at Christ’s School. Religious Education is at the heart of our values, with a particular focus on building positive relationships, exploring life's questions and developing awareness - not only learning about religion, but also learning from religion. Students at Christ's are encouraged to take on responsibility as active global citizens, working to raise money for charities and supporting local community groups. Because of our Christian ethos, we approach each student as a valued individual and support them to develop their God-given potential. We encourage in students a sense of respect for people from other cultures, experiences and backgrounds and a desire to serve and to use their gifts and talents well. Jesus said " I have come that they may have life, life in all its fullness" (John 10 v 10). Christ’s School is outward-facing and we seek to serve the local community wherever the opportunity may arise. We work alongside other bodies to share our resources and to promote the common good in Richmond. The Church is strongly represented on the governing body and there is a strong partnership with Richmond team ministry Churches and Holy Trinity Richmond. To read more about our values of Love, Justice and Peace please see the document below.